Metro-North trains will automatically brake along the sharp curve where a train derailed last week in the Bronx if the engineer hasn't already slowed the train to 30 mph, the MTA announced Sunday. Signal crews have installed new protections at the Spuyten Duyvil curve, where engineers will be warned of the upcoming speed reduction. The changes are among several safety improvements the MTA announced. In the accident last weekend, a train broke apart on the sharp curve, sending cars sliding toward the Harlem River. Four people were killed, dozens were injured and the train was later found to have been going 82 miles per hour. The MTA said that new measures will improve communication between train engineers and conductors at four other curves -- at Yonkers on the Hudson Line, White Plains on the Harlem Line, and Port Chester and Bridgeport on the New Haven Line -- as well as five moveable bridges on the New Haven Line. 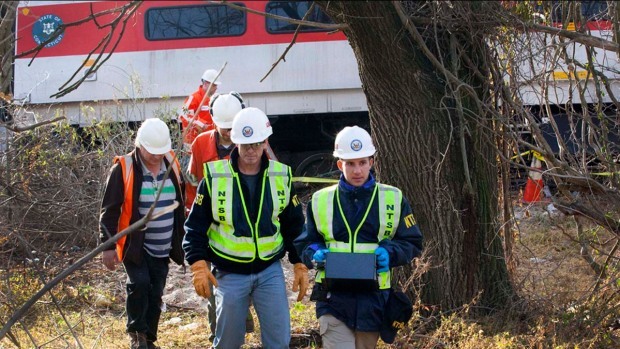 The announcement of the improvements came after the federal government issued an emergency order Friday requiring Metro-North to install two crew members at the controls of trains in areas with significant speed restrictions.